Amos 5:4-6: God’s constant call to us is “Come back to me and live!” “Come to me you who are weary and burdened, and I will give you rest” (Matt. 11:28). There is a call to repentance here: Come back to me (see v. 6 as well). God is pleading with them here. See v. 5: “Don’t go to worship the idols …” This is the voice of a lovingly jealous husband: Come back to me. Please don’t go … But God’s concern is with his bride, not his own feelings. He does not want them to suffer the consequences of their wayward, sinful actions. Both the NIV and The Message translate this “Seek God and live.” Seeking God comes first, before surrender, sharing, serving, and being a good steward. (See I’m a Leader…Now What?) This phrase is found more than 30 times in the Bible. See Isaiah 55:6-7 for what it means to “seek the Lord.” Part of what it means is to forsake your own way and turn (or return) to the Lord. Why should we come back to and seek the Lord? (1) so we may live (v.4); (2) there is no other way to God and the abundant life that comes from being in a relationship with him (v.5). All other ways are false idols; (3) not doing so will have consequences–both directly from God and indirectly from him through natural consequences. Amos 5:21-24: This is another common call from God that shows his heart. See also Isaiah 1:13-17, esp. in The Message. See also Hosea 6:6 and Matt. 15:6-9 for other places. God wants our hearts in worship, not a show or a ritual. God is not pleased with us just because we show up at a small group meeting or a weekend service. 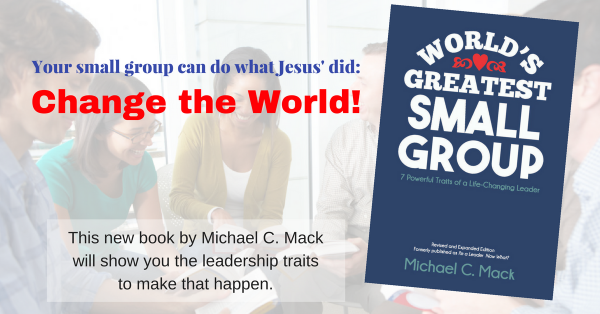 That’s why small groups must be more than just a meeting. A small group must be about seeking God, loving him and one another, including those outside our groups, wherever we are meeting or going. A small group is about living for God and carrying out Christ’s mission, not just a weekly meeting. And a small group should be about justice and mercy for outsiders, not just another meeting for insiders. My Father, I seek you today. When I go astray from you and move toward anything of this world as an idol, help me to come back to you in repentance. You are my only way, my life, and my truth. There is no other way, life, or truth. Give me the power and wisdom to live that way with you and for you today. And as our small group meets, Father, move us toward the message in this and other passages. Help us to do more than just have a meeting. I don’t want us to play games with our group. Help us to come together tonight in your presence, for your purposes, and under your mighty power. By the prompting and power of your Holy Spirit, help us to carry out the mission Jesus has given us. In his mighty name, Amen. Previous article Necessity or Luxary?